Two days ago, one of my students (P) wandered into my room after school to share a problem he had encountered at the 2013 Walton MathFest, but didn’t know how to crack. We found one solution. I’d love to hear if anyone discovers a different approach. Here’s our answer. 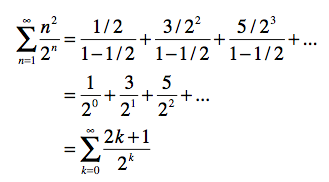 PROBLEM: What is the sum of ? 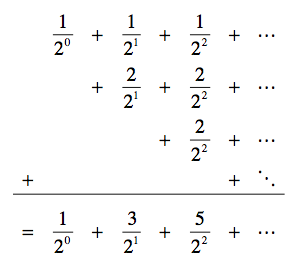 Ignoring the first term, this was finally a single geometric series, and we had found the sum. Does anyone have another way? That was fun. 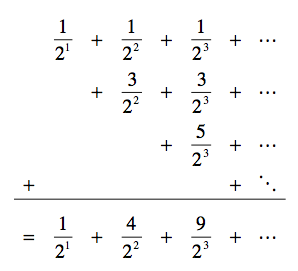 Thanks, P.
This entry was posted in problem-solving and tagged algebra, calculus, precalculus, problem-solving, quadratic, series. Bookmark the permalink.